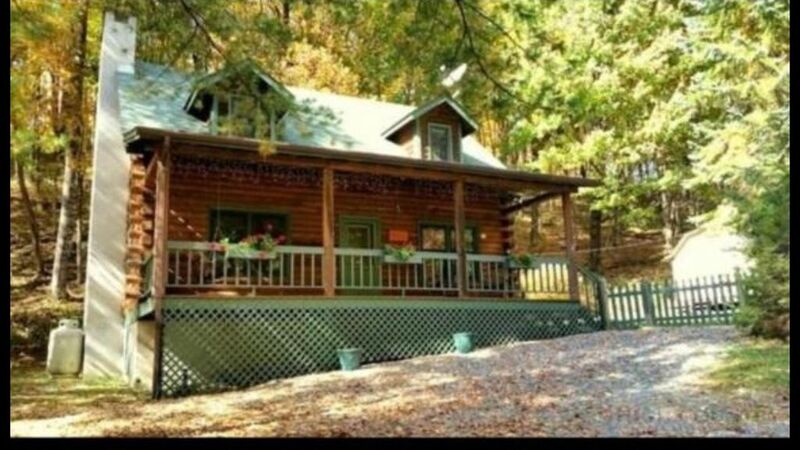 Cozy Log cabin conveniently located between 2 ski resorts and close to Main Street Banner Elk. Entertainment, many restaurants, wineries, outdoor activities all within a short distance. Fully furnished kitchen, gas fireplace, hot tub, fire pit. Enjoy fresh mountain breezes at 4000 ft elevation. Front porch swing and rockers, screened back porch with a relaxing hot tub and gas grill. Short drive to Boone, Linville, Blowing Rock and all that the NC High Country has to offer. Easy road access. Pet friendly. Will entertain long term rentals at a discount. The cabin is exactly as described; it is cozy and welcoming and had all we needed for the weekend! It is very clean and nicely organized. It is located just a mile from the downtown restaurants and conveniences.The fireplace was very nice to have when we got home from dinner each night. Ruben was responsive, communicative, and very kind! We loved the cabin and location! It was very spacious and had everything we needed. The screened porch with hot tub was amazing. We are looking forward to coming back and staying again. We really enjoyed this cabin in Banner Elk, NC! It truly has a warm and cozy atmosphere, especially on the cold nights during our stay. We had fun building fires in the outdoor fire pit, sitting in front of the warm fireplace in the den following supper and relaxing in the hot tub after skiing.The cabin was very clean, well appointed in furnishings and kitchen necessities, and convenient to multiple restaurants and activities in Banner Elk and the surrounding area. Ruben was friendly and prompt in his responses to our emails and made sure we knew he was available if we should experience an issue, which we did not. We would reserve this cabin again should we return to Banner Elk. The home was immaculate. Minutes from Banner Elk and Beech Ski Mountain. Hot tub was great! Fireplace also fabulous. Soft towels, comfy beds and linens. Kitchen was well-equipped. Owner was easy to reach when we had trouble locating the key. breathtaking mountain real log cabin! amazing place! you will love this mountain cabin. excellent location. very private and comfortable. love the hot tub. great kitchen bbq in the screened patio. has a lovely porch. it is near sugar mountain and beech mountain. food lion supermarket is also a short drive away. you will enjoy the fire place and the cozy atmosphere. it’s super clean and has a washer dryer. Very clean and well kept, makes you feel at home. The cabin is in a great location, very close to Beech Mountain Ski resort and not too far from downtown Banner Elk and Sugar Mountain Ski resort. Grandfather Mountain state park is also very close where you can hike the trails and take in the views. There are also 2 wineries where you can enjoy all the different selections or get a bite to eat at the great selection of restaurants in town.